Serotonin syndrome (SS) is a drug-induced constellation of various clinical features. The clinical features range from barely noticeable to fatal. SS is highly under diagnosed condition as majority of physicians are unaware of the SS as a clinical diagnosis. SS in its mild form is more likely to be missed. Physicians may dismiss mild symptoms unrelated to drug therapy. The Hunter serotonin toxicity criteria provide an algorithm to make a diagnosis of SS. This algorithm is predominantly for moderate to severe SS. Only tremor (with hyperreflexia) is recognized as mild symptom in the Hunter serotonin toxicity criteria. However, various case series and review articles suggest that a large number of mild symptoms may be present in patients with SS. ,,, Recognition of even mild SS is important as "an inadvertent increase in the dose of the causative agent or the addition of a drug with proserotonergic effects may provoke a dramatic clinical deterioration". Herein, in this retrospective study, we collected patients who had tremors and hyperreflexia and were on some serotonergic agents (fulfilling one of the feature of Hunter's criteria). This study was conducted as a retrospective chart review of 12 consecutive patients (observed over 12 months in neurology outpatient clinic) who had hyperreflexia with tremor and had taken serotonergic agents in the past 5 weeks. All cases are summarized in [Table 1]. The median age at symptom onset was 34.2 years (range: 18-58). About 58% patients were female. The clinical features are summarized in [Table 2]. All patients fulfilled the Hunter's criteria for SS. Each patient had tremor with hyperreflexia (as inclusion criteria). However, only four patients (33%) reported tremor as a presenting or main feature. The presenting features in other eight patients were: Dizziness (three patients), generalized body pain (two patients), headache (one patient), generalized bodily pain with headache (one patient), and seizure (one patient). Overall, five patients (42%) reported dizziness. Generalized body pain and headache were reported by 4 patients (33%) each. Other common features were nausea (25%), insomnia (25%), restlessness (25%), diarrhea (16%), seizure (8%), and myoclonus (8%). All patients had hypereflexia (as a part of inclusion criteria). In addition, five of these patients (42%) had inducible clonus. Increased muscle tone was noted in five (42%) patients. Other abnormalities on physical examinations were: Tachycardia 5 patients (42%), nystagmus 5 patients (42%), elevated blood pressure 2 patients (16%), and incoordination 2 patients (16%) patients. All these patients had been receiving or had received serotonergic drugs in the past 5 weeks for some other indications. The time interval between the administration of serotonergic drugs and the onset of SS varied from 1day to 2 weeks. Routine biochemical parameters were normal in all patients. On suspecting SS, the patients were asked to stop the drug. Five patients responded to the removal of the offending drug and got a complete response in 2-7 days. In four patients, stopping of the serotonergic agents produced no or minimal effects on the symptoms. Three patients had already stopped the drugs on suspecting theirs symptoms as drug induced. Cyproheptadine was started in these seven patients. It was started at the dose of 8 mg three times daily. Response to cyproheptadine started in 1-3 days of the initiation of cyproheptadine. Complete response was noted in 5-14 days. Patients were asked to continue cyproheptadine for 5-7 more days after disappearance of the symptoms. There were no side effects from cyproheptadine in any patient. All patients were followed-up for at least 2 months. None of the patients had similar symptoms in follow-up. The diagnosis of SS is easily missed as many physicians (up to 85%) might not be aware of this syndrome as a clinical entity. Diagnosis is further complicated because of its protean manifestations. Clinically it is characterized by the triad of neuromuscular hyperactivity, autonomic hyperactivity, and mental status changes. However, the clinical features may range from mild serotonin toxicity (barely perceptible) to life-threatening conditions. The incidence of SS is difficult to assess because of a number of reasons. However, in a large case series of overdoses with selective serotonin reuptake inhibitors (SSRIs), moderate serotonin toxicity occurred in 15% of patients. There has been a reported increase in its incidence because of the wide spread use of SSRIs and other proserotonergic agents. The therapeutic doses of a single serotonergic agent usually cause mild or moderate serotonin toxicity. Severe serotonin toxicity typically occurs to combinations of serotonergic agents. It suggests that prevalence of mild serotonin toxicity could be higher than severe SS. However, the literature is sparse on mild SS. It suggests under diagnosis or under reporting of mild SS. Lejoyeux et al.,  prospectively evaluated for SS in 38 depressed inpatients receiving clomipramine. Forty-two percent patients had at least one symptom of SS (Sternbach's criteria). Kaneda et al.,  studied the prevalence and severity of the serotonin-related symptoms in patients receiving fluvoxamine. None of the patients fulfilled the diagnostic criteria of SS proposed by Sternbach. However, 43.2% patients showed at least one symptom in the Japanese version of the SS Scale (JSSS). Hunter's criterion was not proposed at that time. However, a few patients had tremor (8%) and hyperreflexia (16%). Our all patients fulfilled the Hunter's criteria. Presence of hyperreflexia with tremor (as inclusion criteria) is suggestive of SS if patients have taken serotonergic agents in the past 5 weeks. However, tremor was a presenting feature in only four patients (one patient with insomnia). Other presenting complaints were dizziness, generalized body pain, headache, and seizure. 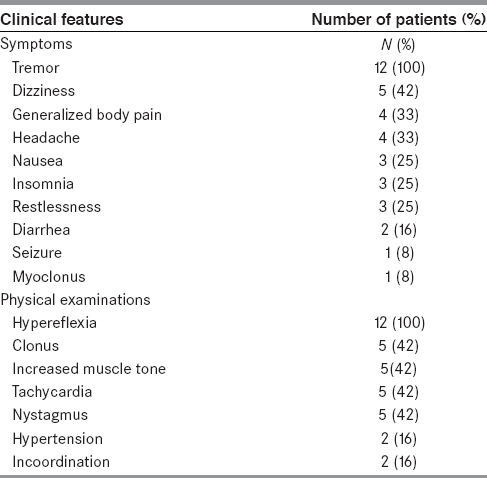 Clinical features of all patients are summarized in [Table 2]. Overall, dizziness was reported by five patients (42%). Dizziness is not a feature in both Hunter's and Sternbach's criteria. However, it was noted by 12.5% patients in a review by Radomski et al. In the study by Kaneda et al. ,16% reported dizziness. Dizziness is a well-known side effect of serotonergic agent. Myalgia (generalized body pain) or headache is not well-recognized feature of SS. However, headache and myalgia are reported as side effects of serotonergic agents. Therefore, a possibility of myalgia or headache as a presenting feature in patients with SS exists. There are a few case reports describing generalized body pain or headache as a presenting feature in patients with SS. ,, Our few patients reported both myalgia and headache. The mild SS may not interfere patient routine activities. However, a diagnosis of mild SS is important. It may be caused by the therapeutic dose of any serotonergic agent. But, escalation of dose or addition of another serotonergic drug may aggravate the symptoms and mild SS may progress to life-threatening severe serotonin toxicity. , There are many case series in the literature where severe SS developed in patients after addition of the second serotonergic drug who already had some mild SS because of first serotonergic drug. , Recognition of mild SS is difficult as most criteria stress on moderate to severe SS. , However, a review of the literature suggests that SS may include a large number of clinical features which may be considered as mild. , The onset of severe serotonin toxicity usually rapidly follows the administration of the offending agent. However, the onset of mild SS may have indolent course or symptoms may go unnoticed by patients. The time interval between administration of serotonergic drugs and the onset of SS varied from 1 day to 2 weeks in our patients. The patient having seizure reported within 24 h. However, all other patients took 4 days-3 weeks before reporting to the physicians. They ignored their symptoms in the early part as these were not interfering with their routine activities. There is no prospective controlled study regarding the treatment of SS. The treatment strategies are based on case reports and speculated pathophysiology in the generation of SS. The intensity of treatment depends on the severity of SS. , Severe serotonin toxicity is a medical emergency and requires urgent attention. Treatment of severe serotonin toxicity begins with the identifying its presence. Cyproheptadine is the drug of choice for the SS. Other drugs with the property of blockading5-hydroxytryptamine 2A (5-HT2A) receptors (chlorpromazine and olanzapine) may also be used. Mild cases are usually managed with supportive care and removal of the offending drug. , Our five patients responded to removal of offending drugs. However, in another seven patients, there were minimal or no response to removal of the drugs. These patients responded to cyproheptadine. Responses started in 1-3 days of initiation of cyproheptadine. Complete response was noted in 5-14 days. Patients were asked to continue cyproheptadine for 5-7 more days after the disappearance of the symptoms. There were no side effects from cyproheptadine in any patient. All patients were followed for at least 2 months. None of the patients had similar symptoms in the follow-up. It is suggested that excess stimulation of brainstem and spinal cord 5-HT1A and 5-HT2A receptors causes SS. In parallel to central 5-HT effects, peripheral 5-HT receptors and other neurotransmitters also contribute to the pathophysiology of SS. , Typically, severe SS starts rapidly following administration of the offending agent. However, it can occur even after discontinuation of a serotonergic drug and it has been suggested that a suspicion of SS could be done even in patients who had taken such drug in the past 5 weeks. Patients on chronic serotonergic drugs can have an indolent course. The literature is silent on the pathophysiology of such different patterns of SS. Intensity of SS is probably related to the extent of increased serotonin. Synergistic effects of two or more serotonergic agents might have more severe symptoms. On many occasions, mechanisms for the generation of SS remain unclear. Various review articles and case series suggest that a large number of symptoms may be present in patients with SS. Diagnosis of severe SS may be straightforward. However, a diagnosis of mild SS may not be simple as mild serotonin toxicity includes a large number of nonspecific symptoms. Our case series highlight that patients may have a wider range of nonspecific symptoms. Making a diagnosis of such patient may be difficult. Tremor is a well-known recognized symptom of SS. Our all patients had tremor, but only four patients (33%) reported it as a presenting complaint. Other patients did not report tremor. It was noted on physical examinations. Disappearance of tremor on removal of the serotonergic drug and by therapy with cyprohepatadine indirectly suggests that tremor was the part of the SS. The presenting features in another eight patients were: Dizziness, generalized bodily pain, headache, insomnia, and seizure. Review of the literature suggests that these all symptoms are the part of the spectrum of serotonin toxicity. ,, Therefore, a possibility exists that any of these may be a presenting feature in some group of patients. Diagnosis of SS is clinical one (with exclusion of other etiology) and diagnosis mainly depends on good physical examinations as diagnosis of SS depends on the demonstration of a few specific physical signs (clonus, hyperreflexia, tremor, ocular clonus, hypertonia, etc.). Such examinations are often omitted by physicians for such nonspecific symptoms. Even the side effects profiles of various SSRIs and other serotonergic drugs are silent about the presence (or absence) of hypereflexia or clonus or hypertonia. Therefore, a diagnosis of mild SS is often missed. A patient with mild SS might continue drug for many months because of the unawareness of SS. The incidences of the SS have been increasing with the increasing use of proserotonergic agents in clinical practice. Every patient with mild SS is a potential candidate to develop severe SS. Patients may receive a second serotonergic drug inadvertently and patients may land into life-threatening severe SS. Therefore, a diagnosis of mild SS is very important. Diagnosis of SS depends on physical examinations. We suggest that any patient on serotonergic drug, if develops any new symptom, should be examined for the presence of tremor, hypertonia, hyperreflexia, and clonus. In addition, every patient on any serotonergic drug should be examined for the presence of mild SS before escalating the dose or before adding a new one. It is a retrospective study and possibilities of unrecognized selection bias and recall bias exist. 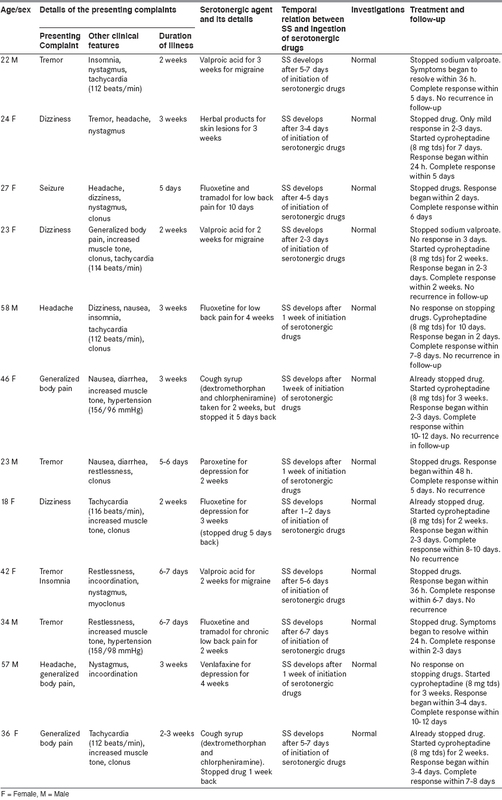 Temporal relation of onset of clinical features with administration of serotonergic drugs and the presence of various physical signs (clonus, hyperreflexia, etc.) suggest a possibly SS. In the same way, resolution of symptoms by removal of the offending agents and treatment with cyproheptadine reconfirm the possibility of SS. However, we cannot rule out a possibility of another cause as full evaluation for secondary cause was not done on each patient. As there is no guideline for the treatment of mild SS, the management protocol was not standardized. A possibility of placebo response is also there in these patients and spontaneous remission may occur in a few patients. The incidence of SS is increasing with widespread use of proserotonergic agents. But, it is highly under diagnosed condition. Under diagnosis is more likely with mild SS. Every patient with mild SS is a potential candidate for developing life-threatening, severe SS. There is a need to increase its awareness. It is suggested that every patient on serotonergic drug should be examined for the presence of tremor, hypertonia, hyperreflexia, and clonus. Boyer EW, Shanon M. The serotonin syndrome. N Engl J Med 2005;352:1112-20. Radomski JW, Dursun SM, Reveley MA, Kutcher SP. An exploratory approach to the serotonin syndrome: An update of clinical phenomenology and revised diagnostic criteria. Med Hypotheses 2000;55:218-24. Bartlett D. Serotonin syndrome: A subtle toxicity. J Emerg Nors 2006;32:277-9. Lejoyeux M, Rouilon F, Ades J. Prospective evaluation of the serotonin syndrome in depressed in patients treated with clomipramine. Acta Psychiatr Scand 1993;88:369-71. Kaneda Y, Ishimoto Y, Ohmori T. Mild serotonin syndrome on fluvoxamine. Int J Neurosci 2001;109:165-72. Mackay FJ, Dunn NR, Mann RD. Antidepressants and the serotonin syndrome in general practice. Br J Gen Pract 1999;49:871-4. Isbister GK, Bowe SJ, Dawson A, Whyte IM. Relative toxicity of selective serotonin reuptake inhibitors (SSRIs) in overdose. J Toxicol Clin Toxicol 2004;42:277-85. Edwards JG, Anderson I. Systematic review and guide to selection of selective serotonin reuptake inhibitors. Drugs 1999;57:507-33. Alnwick GM. Misdiagnosis of serotonin syndrome as fibromyalgia and the role of physical therapists. Phys Ther 2008;88:757-65. Prakash S, Belani P, Trivedi A. Headache as a presenting feature in patients with serotonin syndrome: A case series. Cephalalgia 2014;34:148-53. Isbister GK, Buckley NA, Whyte IM. Serotonin toxicity: A practical approach to diagnosis and treatment. Med J Aust 2007;187 361-5. Ganetsky M, Brush E. Serotonin syndrome - What have we learned? Clin Pediatr Emerg Med 2005;6:103. Lamberg JJ, Gordin VN. Serotonin syndrome in a patient with chronic pain polypharmacy. Pain Med 2014;15:1429-31.